To load sample entries that you can change as needed, tap the "Sample" button. To clear sample entries, tap the "Clear" button. Enter the current balance of your 401(k). Enter as a dollar amount but without the dollar sign and any commas. If you have yet to start your 401(k) contributions, enter a zero. Enter the annual rate of return you expect to earn on your 401(k). Enter as a percentage, but without the percent sign (for .07 or 7%, enter 7). When planning for the future it's always best to estimate income low and expenses high, so I suggest you enter a conservative rate. Enter your current annual salary. Enter as a dollar amount but without the dollar sign and any commas. If you are not sure how much your period wages add up to over a 1-year period, tap the PCalc tab to multiply your gross wages per pay period by the number of pay periods per year. If you expect your salary to increase by a certain percentage each year, enter the percentage here. Enter as a percentage, but without the percent sign (for .03 or 3%, enter 3). Again, it's best to be conservative when it comes to forecasting future income. If you don't foresee an annual percentage increase in your salary, leave this field blank. Select how often you get paid. The calculator will use this frequency to add contributions to your 401(k), as well as for compounding the interest. Enter the percentage of your salary you plan to contribute to your 401(k). If you don't check the box on the next line, your contribution will increase along with your projected salary increases. On the other hand, if you check the box on the next line (the Save Your Raise feature) and enter a percentage of raises to contribute, then your beginning base year contribution will be used for all remaining years, but each total annual contribution will be a combination of the base plus the entered percentage of the cumulative total of all raises from prior years. In either case, if the calculated contribution exceeds the maximum allowed by the IRS (plus the catch-up amount if age 50 or older), the maximum contribution will be used instead (current maximum and catch-up amounts are listed on the Learn tab). If you would like to contribute all or a percentage of all future raises, check the box in this row. Once a checkmark appears on this line, the percentage field will be enabled. If you want to contribute 100% of all raises, enter 100. Otherwise enter your preferred percentage, but without the percent sign. Note that if the calculated contribution exceeds the maximum allowed by the IRS (plus the catch-up amount if age 50 or older), the maximum contribution will be used instead (current maximum and catch-up amounts are listed on the Learn tab). If your employer will be matching all or part of your contributions, enter the percentage on this line. Enter as a percentage, but without the percent sign. The actual employer match will depend on whether or not the matching amount exceeds the percentage of your salary as indicated on the next line. If the calculated amount exceeds the maximum percentage of your salary, then the maximum amount will be used instead of the calculated amount. Enter the percentage the employer uses to limit the matching contributions -- expressed as a percentage of your annual salary. Enter as a percentage, but without the percent sign. This is the number of years between your current age and the age you plan to retire at. Based on your entries, this is how much your 401(k) will have grown to by the time you retire. Note that this amount is subject to income taxes as portions are withdrawn. Based your entries, this will be the total of your contributions to your 401(k) between now and when you retire. Based your entries, this will be the total of the contributions made by your employer between now and when you retire. Based your entries, this will be the total of your interest earnings your 401(k) between now and when you retire. Based your entries, this is your estimated, before-tax annual retirement income from your 401(k). This 401(k) Retirement Calculator will calculate how much your 401(k) will be worth by the time you reach the age you plan to retire. The calculator includes options for factoring in annual salary increases and employer matching contributions. You can also print out printer-friendly reports for any number of what-if scenarios. Finally, the calculated results include a year-by-year salary, contribution, and balance chart, plus a written summary. If you want to see how your 401(k) fits within your overall retirement needs I suggest you visit the comprehensive Retirement Plan Calculator. Save Your Raise? What a Great Idea! What led to the creation of this calculator was the following excerpts from an email I received from a visitor to the site. Of course, the first thing I realized after receiving the email is that I didn't have a 401(k) calculator on the site, much less have one with a "Save Your Raise" feature. Well, after building the calculator and seeing for myself what a huge difference it can make to contribute all (or even a modest percentage) of your future raises to your 401(k), it's no wonder employers are encouraging their employees to save their raises. Thank you, Trey, for taking the time to submit your valuable and enlightening request. If you wish to begin with a sample set of entries, tap the "Sample" button. Enter your current 401(k) balance (if any) and the annual rate of return you expect to earn. Enter your current annual salary and the percentage you expect it to grow by each year (if any), and then select your pay frequency. Enter the percentage of your salary you plan to contribute to your 401(k) each year. Check the box on the next line if you wish to contribute all or part of your future raises (Save Your Raise feature), and enter the percentage of your raises to contribute. Enter the percentage your employer matches your contributions (if any) and the maximum percentage of your salary that your employer will match. 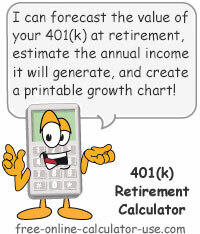 Tap the "Calculate 401(k) Future Value" button and scroll down to view and/or print the results. What a 401(k) is, how it works, and what the contribution limits are. A 401k is basically a tax-deferred, retirement savings plan that is sponsored by an employer. In other words, as long as you don't withdraw the funds until age 59-1/2, you pay no income taxes on the portion of your salary you contribute to your 401k, nor on the interest earned, until you actually withdraw the funds. One of the reasons 401k's are popular with employees, is because in many cases employers offer to match all or part of their employees' contributions -- usually up to a certain percentage of their annual salary. However, in most cases you will need to work for your employer a minimum number of years before you become the actual owner of the matching contributions (also known as becoming "fully vested"). You choose where you want the funds invested (usually from a selection offered by your 401k plan). You designate an amount or percentage of your wages to contribute to your 401k. Your employer withholds your contributions from your gross wages (before taxes are taken out) and deposits the contribution -- along with any employer match -- into your 401k. Earnings on your 401k grow on a tax-deferred basis. Once you reach age 59-1/2 (or age 55 if you officially retire) you can begin making withdrawals from your 401k without penalty. Prior to that you may be assessed a 10% early withdrawal penalty. In either case, your withdrawals will be subject to income taxes. Lastly, the tax implications created by 401k plans can be very complex, so please be sure to consult with a qualified tax professional before making any decisions related to your plan.